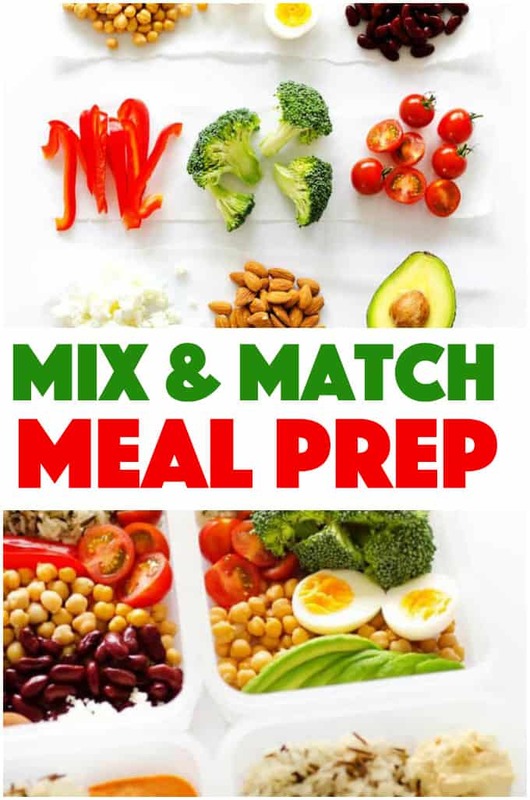 Meal Prep: mix and match to make delicious & healthy flavor combinations! Have you been wanting to learn how to meal prep your lunches, but are a bit overwhelmed at figuring out what ingredients go together? 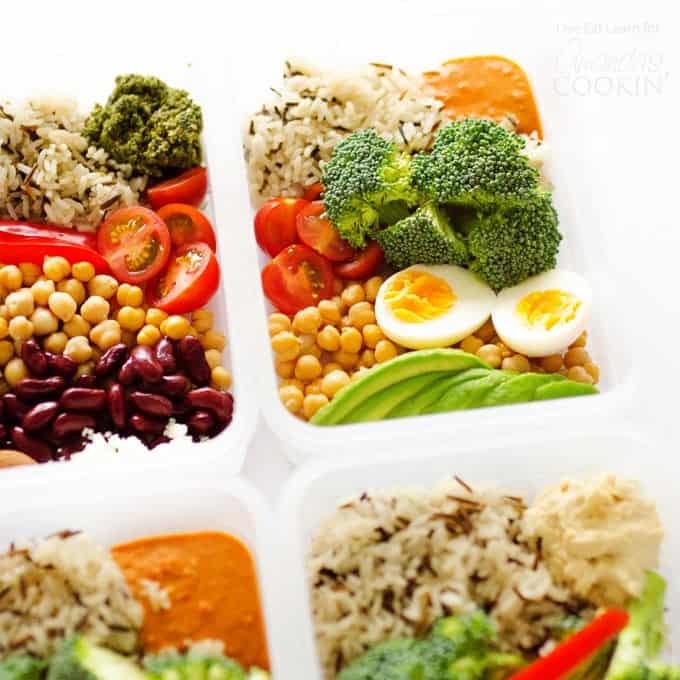 This Mix and Match Meal Prepping is an easy formula for getting lunch made quickly and deliciously, just like our Chickpea Gyro Lunch Boxes. I’ve always liked the idea of doing a meal prep but always had a hard time jumping into it. For some reason, I thought it would be confusing or hard or time-consuming. Boy, was I wrong! As it turns out, making healthy lunches for the week is actually easier when you do it in big batches. And the reward? Healthy, flavorful lunches all week that aren’t hastily thrown together sandwiches. So how does it work? Pick one or two items from each group to put in the boxes. Maybe on Monday, you want your protein to be egg and your veggie to be peppers…great! The next day you can have chickpeas with broccoli…also great! Mix and match without fear, everything goes well together (and you may even find a new favorite combination!) Speaking of, if you’re looking for new flavors and combinations, feel free to check out Cook It Fresh, a meal plan program that gives you 31 tasty dinners while doing all the hard work for you (you know, the grocery lists, converting to fit your family size, the fun stuff). Meal prep has never been easier! For more delicious lunch recipes be sure to check out this burrito bowl. Packed with cilantro lime rice, avocado, corn, peppers and shredded beef. This is a burrito bowl you don’t want to miss! How about a delicious toasted cheddar, ham and arugula sandwich for lunch? Nothing quite beats a toasted cheese sandwich for lunch! 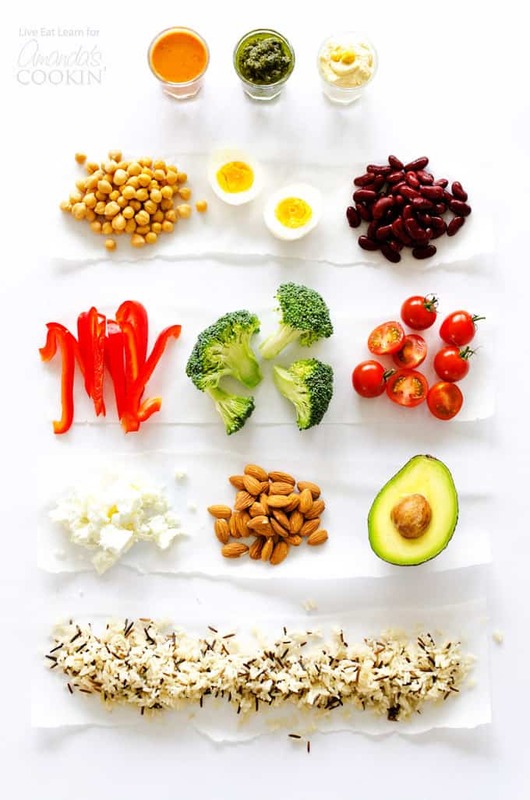 If you want more ideas for healthy lunches here are 90 no-heat healthy lunch ideas for on the go! 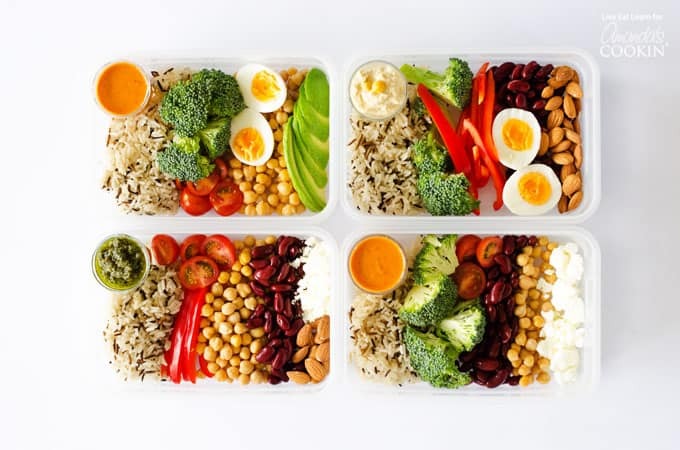 This Mix and Match Meal Prepping is an easy formula for getting a vegetarian lunch made quickly and deliciously. Set out 4 or 5 resealable containers. Mix and match ingredients, adding the starch of your liking as a base, followed by some proteins, veggies, and fats. Be sure to divide ingredients out (for instance, divide your can of chickpeas among 2 or 3 of the containers. Either drizzle with the sauce of your liking or pour into small separate containers and dress right before chowing down!